The President’s Volunteer Service Award (PVSA) is our country’s premier volunteer award program encouraging citizens to live a life of service through presidential gratitude and national recognition. The award is presented through the office of the President of the United States and the Elks Drug Awareness Program. The award encourages you to look around, be inspired and take positive action that changes the world. The Elks Drug Awareness Program presents the lifetime PVSA to an adult who has volunteered 4,000 or more hours over their lifetime. To date, more than 2,000 volunteers nationwide have been recognized for their service. 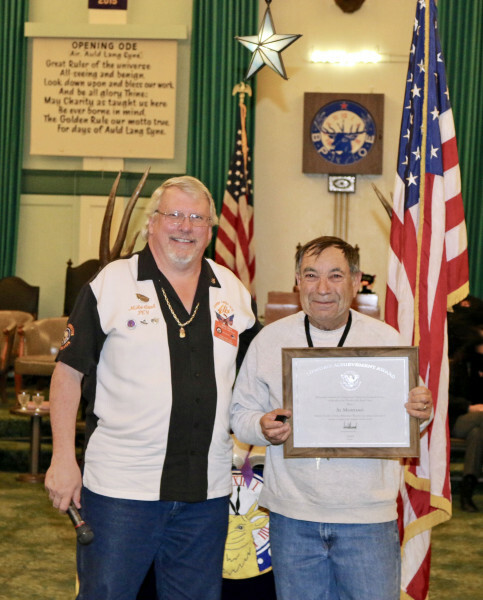 Al Montano is the third member of the Orange Elks Lodge #1475 to achieve this award. Al is chairman the Dictionary Program. Each year, he raises money for the dictionaries, obtains the number to purchase, stamps and inserts a Drug Awareness book mark and organizes delivery. In the last fourteen years, the Elks have delivered over 30,000 dictionaries to 3rd grade students in the Orange Unified School District.